Fresh off the back of his Glitterbox remix of CamelPhat & Elderbrook’s track ‘Cola’, Mousse T. drops his first original release on the Glitterbox label, showing off his production skills in this track ‘Rock The Mic’. Mousse T. enlists the help of artist TAZ, the man who apparently became the first UK rapper to sign to hip hop label Def Jam, also earning a prestigious Ivor Novello award nomination for his writing skills. 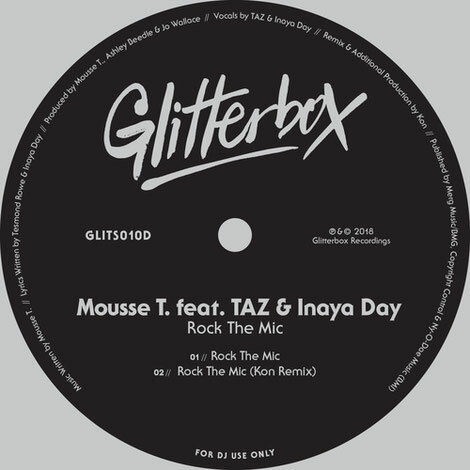 ‘Rock The Mic’ also reunites Mousse with American song writer Inaya Day, best known for her vocals on the German producer’s biggest record, ‘Horny’. The catchy hook and groove of the track intertwine over smooth strings to make this record. The collaboration combines hip hop with disco, giving you the best of both worlds, delivering six minutes of music alongside a percussive remix courtesy of Kon. It’s out 12 Jan 2018.